The new idea of connecting your Apple New MacBook, Smasung Galaxy S8 or Chromebook Pixel to a large screen display for product presentation or educational presentation, is getting more and more popular. To make the content in your mobile tablet shown in a larger screen, you can simply use a USB C to VGA cable, or more commonly named a USB-C to VGA Cable Male to Male Converter. 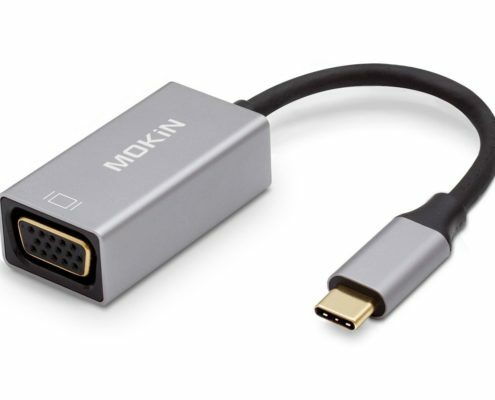 These new USB C to VGA adapters are made with better connectivity for USB Type C to VAG cable male to male adapter. You can enjoy 1920 x 1200 and 1080P full HD display. And the USB-C to VGA adapter manufacturers highly improve the compatibility with more thin portable computers with better stability in data transfer. You can have high quality footage, image and audio in your large monitors and projectors from your tablets. On Amazon, such a versatile online market, wherein we are able to help you pick the best quality USB C to VGA cable adapters for your Apple New MacBook 2017, Samsung Galaxy S8, Chromebook Pixel, Dell XPS 13 and more other USB Type C compatible devices. This Thunderbolt 3 USB C male to VGA male cable connects your USB type-c device such as Macbook Pro 2017/2016, Chromebook to any VGA display. It can support up to 1920 x 1200 and 1080p (Full HD) for compatibility with most displays, monitors and projectors with VGA; Audio must be transmitted separately. This converter is easy to use without the need of using an extra driver. Just plug and play simply, you don’t need any installation for it to work. This VGA adapter is believed to be perfectly suitable for Samsung Galaxy S8, Apple New MacBook 12″ and MacBook Pro 2017/2016 13 inches and 15 inches with Touch Bar and more USB C devices. 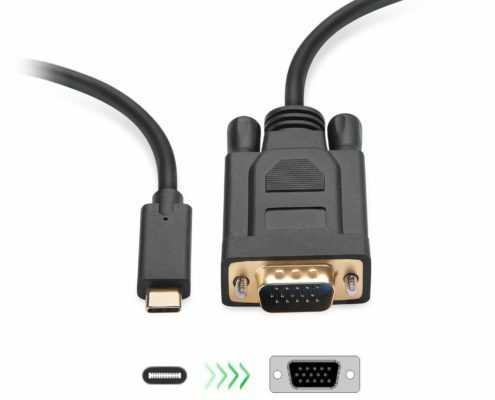 The VGA connects easily and stably to male VGA cables with strong signal without flickering. The cable itself is thick and shows no sign of wearing out after daily use & being tossed in the main compartment of a backpack. This USB-C VGA multiport adapter allows you to plug and play effortlessly. The adapter doesn’t need any external software driver or power source to make it work. Plus, the USB C offers great conveniences for the reversible plug direction. 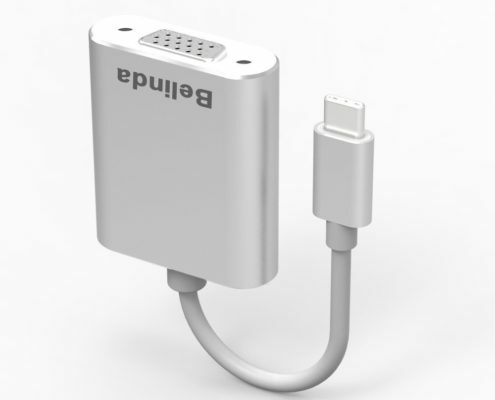 This USB 3.0 Type C to VGA with PD cable adapter has a durable casing which is made of sturdy ABS and PC plastic. The sturdy braided USB cable is strongly built to ensure stable signal transimission. Aibocn uses most up-to-date anodized aluminum alloy for the USB Type C male head for easy connection with great durability. 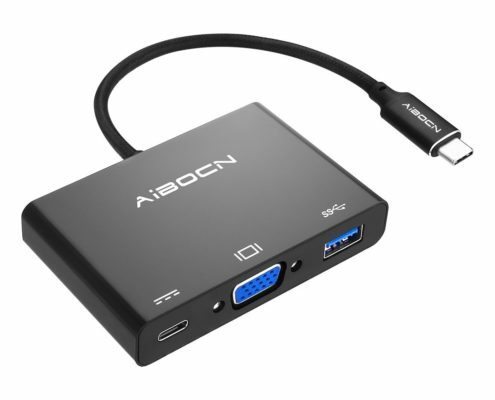 Aibocn USB-C digital VGA multiport adapter ensures safety for the heavy-duty cable and the high quality adapter design. The built-in protection safeguards your devices and the adpater against overload, over heat, over discarge, short circuit problems. Likewise, this USB C to VGA adapter requires no dirver to install. The perfect VGA adapter for new devices with USB Type C or Thunderbolt 3 has a gold-plated VGA interface for better signal transmission. It supports up to 1080P @60Hz 1920*1200@60Hz (HD),800×600, 1024×768, 1280×768, 1280×800, 1280×960, 1280×1024, 1440×900, 1600×1200, 1680×1050, 1920×1080. 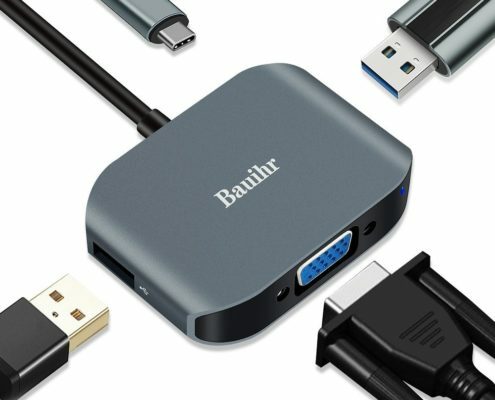 This USB-C To VGA adapter allows you to extend video or image from your new laptops with a USB-C port to your TV/monitor/projector with a VGA port. This USB Type C to VGA adapter is a useful VGA Adapter with USB 3.0 & USB 2.0 Port, USB C to VGA (Up to 1080P@60Hz) for your monitors, projectors etc; USB C to USB 3.0 with better effect for flash drives, date transfer etc; USB 2.0 port for keyboards, mouse or other peripherals. When you plug in the VGA cable to the VGA port and then connect it to your laptop, the screen will show HD results for display. It’s widely compatible with your MacBook Pro(13 Inch & 15 Inch) / 2015/2016 MacBook / Samsung ChromeBook Plus/Pro / Lenovo YOGA 900-ISE(YOGA 4 Pro) / Dell XPS 12/13/15 / HP SPECTRE 13 / Acer swift 7 / Razer Blade Stealth etc.